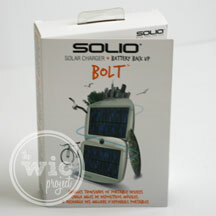 When it comes to total coolness, the Solio Bolt Solar Charger from The Ultimate Green Store scores off the charts. It is probably one of the coolest gadgets I’ve gotten to use in awhile, and that’s pretty impressive considering that it only does one thing – it charges. Whether it’s your cell phone, your iPad or even your digital camera, the Solio Bolt Solar Charger can charge them all using the power of the sun. The Solio Bolt solar charger is your perfect companion, keeping you online and in-touch on the go. With an on-board battery and rotating solar panels, the Solio Bolt charges popular USB powered gadgets from your smartphone and MP3 player, to your e-reader, GPS, and camera. I could hardly wait to test out the Solio Bolt. Before I even got inside the house, the package had been opened and I was ooh-ing and aah-ing at the solar wonder that is the Solio Bolt. Along with the Solio Bolt, the box also contains a Micro-USB cable, which is used for charging, and a pencil which you can use to prop up the Bolt towards the sun for optimal solar charging. 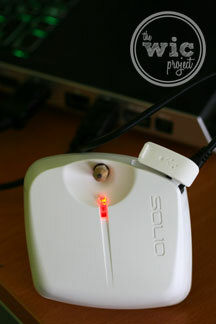 To charge the Solio Bolt, you can either plug it into a power source via USB (such as a laptop or your computer) or you can charge it using the sun via their two high-efficiency solar panels. It’s been a little cloudy around here, so we plugged it into the laptop for charging. The light turns red so you know that it’s charging up. The Solio Bolt reached full charge very quickly (I think it was just a few hours if I recall correctly) and then it was ready for use. Before you start charging, you can see how much charge is on your Solio Bolt by pressing the power button. 5 flashes of green and you have more than 80% charge; 1 flash and you have just over 1% charge. I was completely impressed that the Solio Bolt was able to fully charge my iPod touch in less than an hour and still had enough juice to charge up my cell phone. This is a great gadget for people who are on the go and often find themselves needing an electronic “charge.” Whether it’s out hiking (where there are no outlets) or maybe you’re stuck in traffic (without a charger), you can easily charge your device with the Solio Bolt. 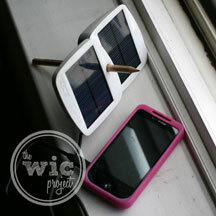 By far, the best thing is that you can charge the Solio using solar power. I’ve experienced more than enough power outtages to know that you can’t always count on wall outlets to keep your electronics charged. I remember a snow storm not too far back where people were without power for days. If they’d had the Solio Bolt, at least they could have charged up some of their portable electronics for entertainment and music. If the Solio Bolt isn’t quite your thing (but really, how could that be possible) then make sure you browse the other green products available from The Ultimate Green Store. As one of the largest online green retailers, they have green items for the home, babies, kids and eco-gifts! One winner will receive a $25 gift certificate to The Ultimate Green Store. I like the bamboo towels they have. I would love to try the bamboo towels. I like the Laptop Lunch Box Kits 2.0. 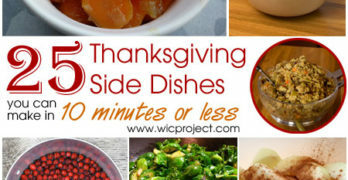 I love the Eco-Friendly Wonder Walker! I like their bamboo towels! Happy holidays! Thanks so much for the fantastic giveaway! I love the EarthDog Hemp Dog Bed! I would love a pair of bamboo sheets! I’d like the Califoria Baby Calming Newborn Tote gift set. I would love to try the Lavender Hand and Body Lotion. I like the California Baby Sunscreen! Any of the organic baby girl clothes! I like the Recycled Seatbelt Medium Tote Handbag in Green Camo. I like the DayNa Decker Provence Lavender Couture Chandel – 6 oz. Love the OffGrid Solar Recycled Backpack. from Coyuchi in the olive/white color! gorgeous! I like the recycled glass drink bottles. I really like the Bamboo Towel sets. 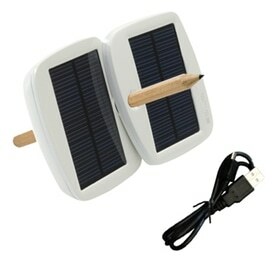 I would like to try the ipad solar charger. I like the earthdog hemp dog bed.